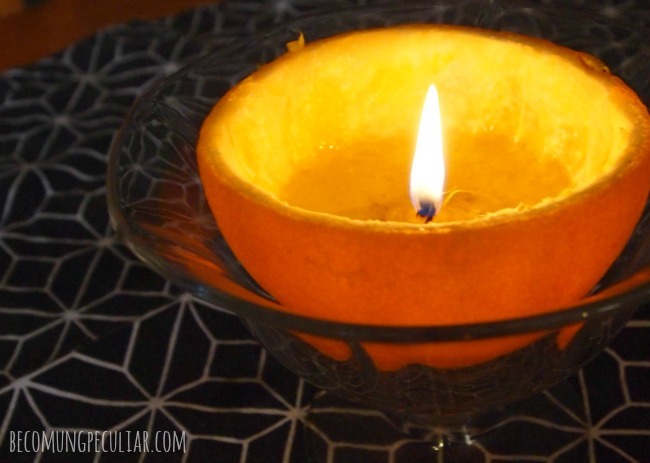 Here’s a neat little craft/activity you and your family might enjoy: turn an orange into a candle (with stuff you already have in your house)! We love having a candle burning while we eat our dinner, especially during the dark winter evenings. I typically burn my own homemade tallow-and-beeswax candles — it’s important that my candles are clean, natural, and unscented, especially around food. 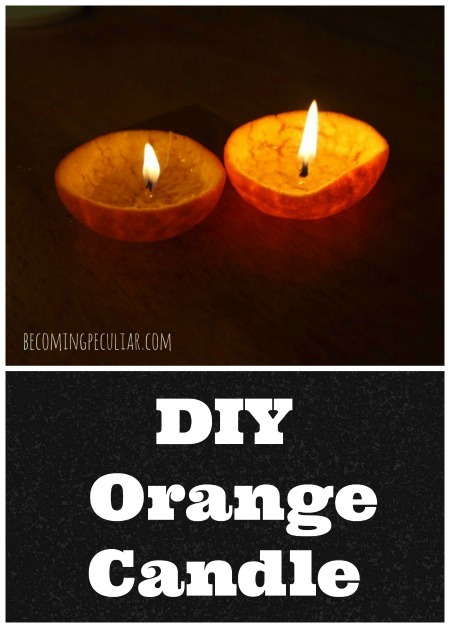 But this DIY orange candle was a fun little twist. The orange rind acts as a bowl to hold the oil, and the orange’s “central column” (which you have to keep intact) acts as the wick. 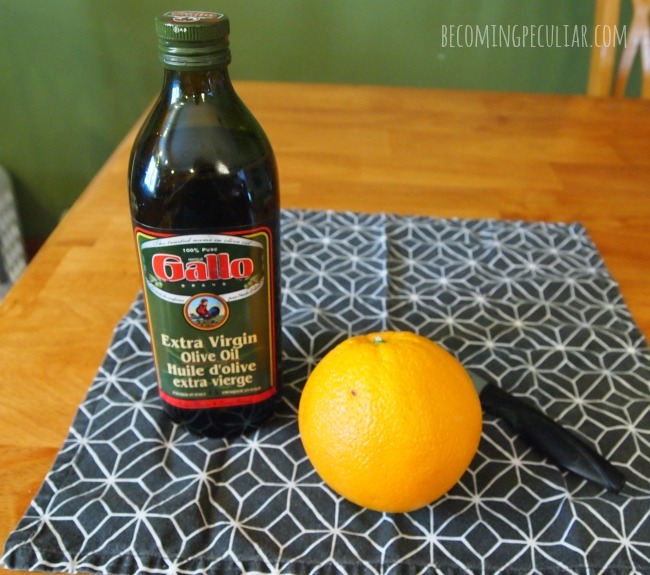 We first tried this on little tangerines, and they burned for hours and hours! They have a slightly citrusy scent, which is delightful. it really helps to work over a napkin, because it gets pretty messy. 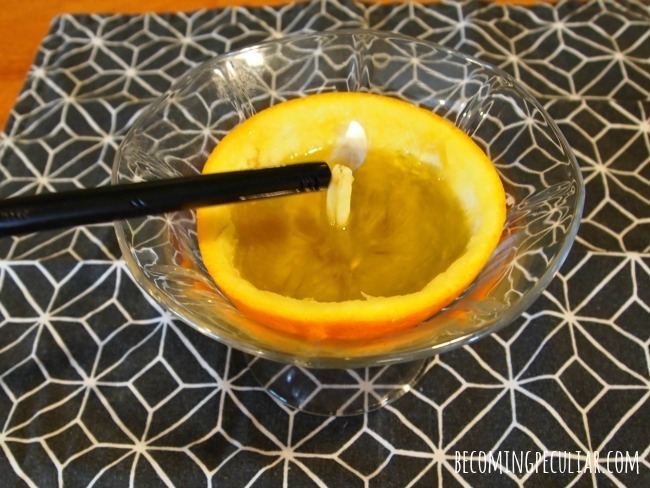 a spoon is helpful to loosen the fruit from the peel. 1. 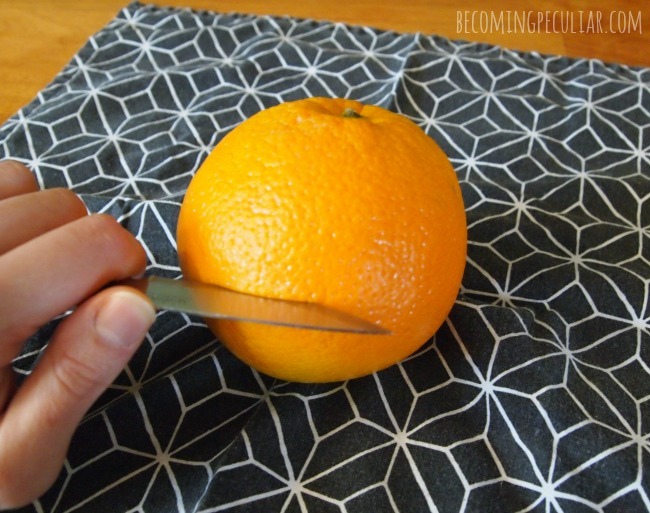 Using a small knife, cut just the skin of the orange around the equator. 2. 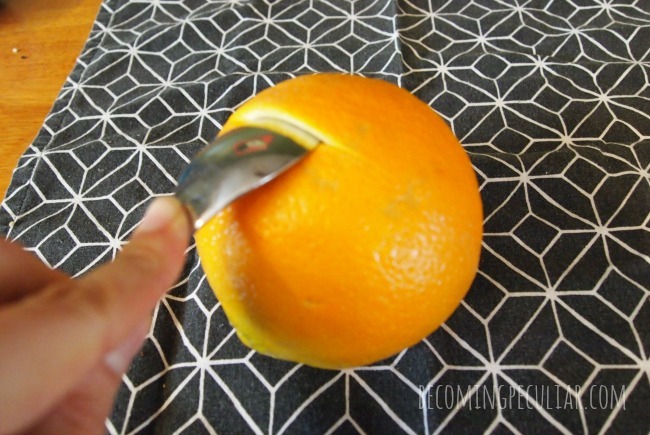 Loosen the orange peel from the fruit. A spoon is really helpful for this step. 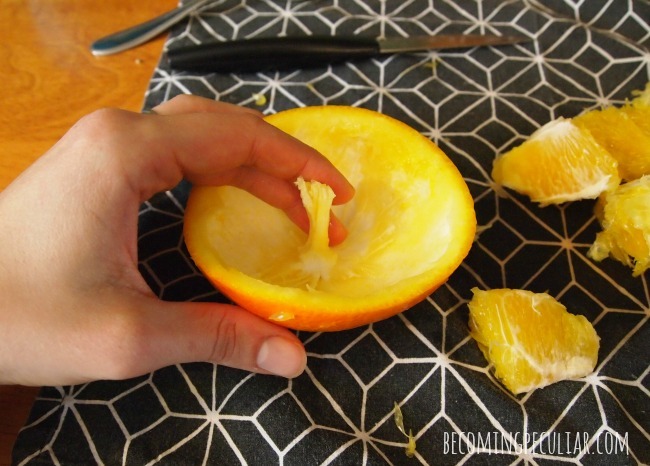 Stick the tip under the rind and slide it around the perimeter of the orange to separate the rind from the fruit. If you don’t have a spoon, you can do it with just your fingers, but it will be messier. 3. 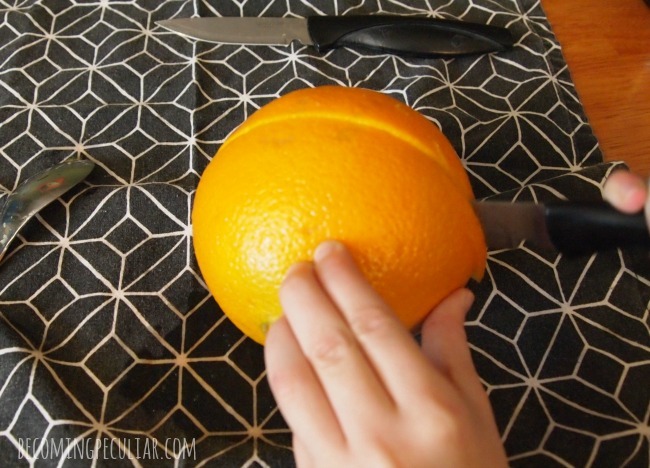 Go ahead and cut the orange in half now, all the way through. 4. 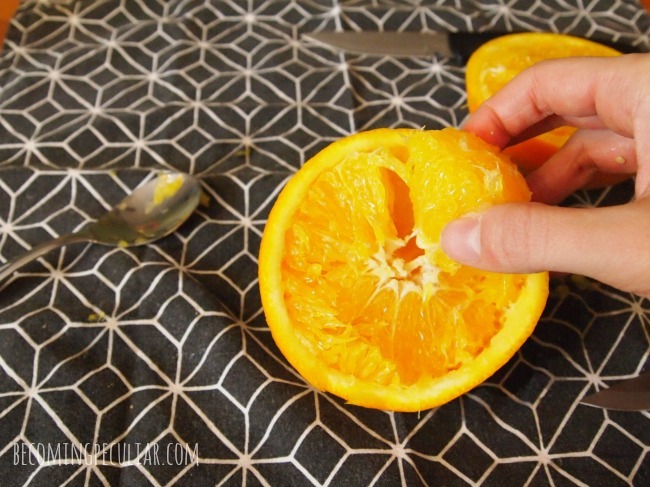 Now scoop out the fruit from both halves, being careful to keep the orange’s “central column” attached. Now you have two candle bowls with wicks! Go ahead and eat the fruit while you’re at it. Vitamin C! 5. 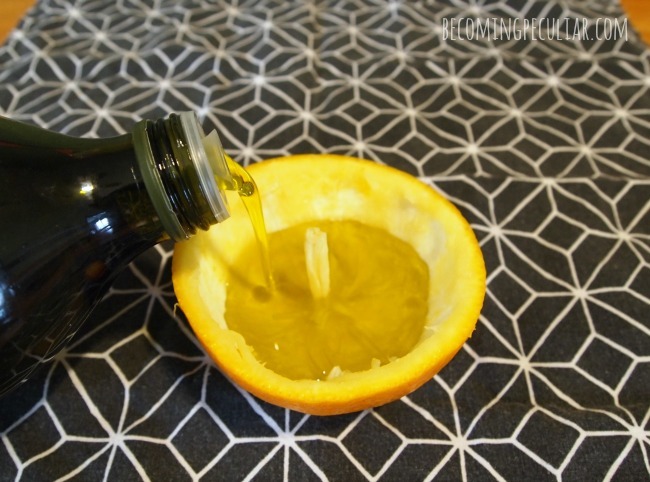 Fill the orange halves with cooking oil, making sure to get some on the wick. I used olive oil. I think just about any oil would work: vegetable, canola, peanut . . . whatever you have on hand. Just leave a little bit of the wick sticking out. Note: be sure to place your orange candle on a ceramic or glass (or other heat-safe) dish before lighting. It can get very hot when it gets down to the bottom and could burn your table. I don’t want to be responsible for any house fires! Lighting might take a few minutes, especially if you use a large orange with a really wet, fleshy column. (Yeah . . . sorry if that sounded perverted. I noticed it too.) Be patient and keep trying. The wick needs to be soaked in oil. And there you go! Your homemade, all-natural candle! Keep an eye on your candle and keep adding oil as the level burns down, and it will keep going for hours. My first tangerine candles burned for over 4 hours! Jury’s still out on the navel orange. We’ve lit it every evening for the last 3 days and it’s still going strong. this is awesome. Did I ever tell you this is my favorite blog? Fun to get several posts in one week! I just tried this! It took a while to light, but it worked. My children are delighted (as am I). Yay! Glad it finally worked! 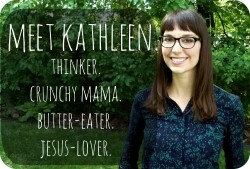 Kathleen!!! I was just hopping to comment how much I missed your posts – and I’m so happy to see not one, not two, but THREE new posts since my last visit! Definitely going to try this. We go through clementines by the dozen here! Does it have a citrus fragrance at all? OMG – wet fleshy column. I snorted. How cool is this? Very! I think it would be a great project for the kids, with supervision of course! It would definitely encourage them to eat more fruit. Make it a proviso, eat the fruit get to make the candle. I love it. Am off to SE Asia later this year so will use that as an excuse to try with all kinds of local fruits I find. Thanks for the great idea and article!